A job interview can be a highly stressful undertaking. It’s probably your only chance to make a lasting impression on your potential boss and it needs to be an impression strong enough to get you hired. When it comes to staying calm and presenting your best self in an interview, preparation is key. You need to research the company and the job, as well as show enthusiasm and interest. You also need to look the part. The truth is you don’t often get a second chance to make a first impression and appearance counts more than you know. We live in a visual society and the first thing someone who has never met you before will notice is your outfit. And they’ll use that to make all sorts of assumptions about your personality and to picture you in the potential role. What do you want your look to tell the interviewer? And how will you get it to do just that? 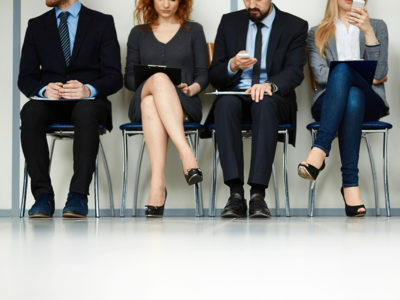 While different workplaces have different dress codes, our candidates mean business so, when in doubt, we suggest that you over- rather than under-dress for every job interview. This doesn’t mean putting on your best ‘going out’ outfit. Rather, your key style word should be ‘professional’. If you want a potential employer to take you seriously, as someone who can bring true value to their company, you need to act and dress the part. Keep it clean: It doesn’t cost a lot of money to look neat and tidy. Scuffed shoes, a dirty shirt, or messy hair give the impression that you don’t care about your personal appearance and, it might be assumed, your standard of work. A neat, well-presented look speaks volumes about how you think about yourself and your value. Avoid tight skirts that are difficult to sit down in. Rather, keep them an appropriate length and fit. The same goes for tops that show too much cleavage or are too tight. These are no-no’s when it comes to a professional look. Can’t walk in high heels? Wear kitten courts instead. You’ll look smart and avoid the chance that you’ll fall over and embarrass or even hurt yourself. A collared shirt with a pencil skirt or tailored pants and closed shoes are all great choices for an interview outfit. Avoid tee-shirts, board shorts (or any shorts! ), and any beach wear. Don’t wear flip-flops or sandals to the office. Rather, wear clean work-appropriate shoes or laced brogues. And, always match your belt to your shoes. A suit and tie have their place but you can also go for a collared, buttoned shirt, smart work pants, and polished smart shoes for a great interview look. Match your personal style to the company culture: If you’re going to work in a professional or corporate industry, you shouldn’t dress as if you’re off to a nightclub or a day at the beach. If they take themselves seriously, so should you. If you can, visit the company before the interview to find out how the employees dress in their workplace and take care to match your clothes to the role you want. Want to wear a brightly coloured top in your signature colour to give yourself a confidence boost? Go for it but pair it with a smart, dark jacket or tailored pants to show you mean business. Wear smart shoes instead of sandals (and never wear flip-flops! ), and avoid garish accessories that detract from a polished look. Dressing for the job you want and showing that you take the interview process seriously should be your style guidelines if you want a real chance at landing the job.